Mackinnon is a traditional-style residence and houses approximately 115 residents. Situated at the centre of campus, Mack is a mere stone’s throw from practically everything at Bishop’s. Mackinnonites also enjoy the use of a common kitchen facility, TV lounge, and the Blue Room, an inviting lounge and study facility. You and the friends you’ll make will be glad you spent your year in Mackinnon Hall! Each of the RAs from Mackinnon has written a bio to welcome students. If you have any questions, please email the RA for your section. 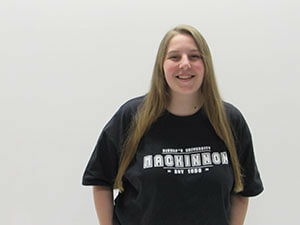 My name is Hailea and I am the Team Coordinator for Mackinnon! For me, home is a small town called Ladner just outside of Vancouver, B.C. This will be my third year on the Rez life team, and my fourth year here at Bishop’s doing a double major in Music and Psychology. My main instrument is piano and I’m always up for jamming with others. 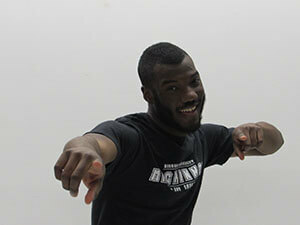 For the most part, I am very outgoing and am always willing to help out where help is needed. I am very social and love hanging out and meeting new people, so don’t be surprised when you see that my door is almost always open and don’t be shy to stop by and say hi! If I’m not in my room and not busy in class, eating, etc, there’s a good chance you can find me doing handstands somewhere on campus, as being up-side down is one of my favourite pass-times. The Rez Life team is like a family to me and it helps me feel at home at BU and I want to help you guys feel comfortable and at home here too, understanding that the transition to university can sometimes be a scary one. I hope to establish a very positive, safe, and healthy atmosphere by getting to know you and by running some super awesome events! If you ever have any suggestions for events you want to see take place during your first year here, let me know and I can help you get involved. If you have any questions, comments, or concerns about next year, or just want to say hi, feel free to send me an email at hcaldwell15@ubishops.ca and I’ll answer as soon as I can. I can’t wait to see all your BUtiful faces on move-in day!! Hey, future Gaiters! 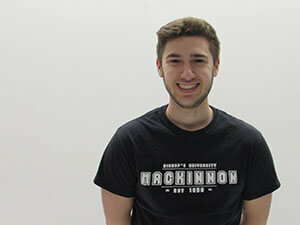 My name is Sebastien and I will be the Senior Resident Assistant (SRA) for Mackinnon (Mack). I was born and raised in the Ottawa-Gatineau area and I am going into my second year here at Bishop’s as a Psychology major. My pastimes include playing rugby, singing along to Disney movies, drinking tea and writing. I am looking forward to the social, open warm and friendly feel of Mack along with its proximity to Dewies. I personally fell in love with Bishop’s before stepping foot on campus. The look in my friends’ eyes as they talked about this place was amazing and I hope each of you has a great year. Hi! My name is Megan Cooper and I am one of your Mackinnon RAs for the 2018-2019 academic year! I am a Neuroscience student from a small town near Ottawa, Ontario called Embrun. I spent my 8th birthday in the hospital. It was then that I decided I wanted to be a doctor to help others like the doctors and nurses that helped me. Since then, I have decided that I want to become a neurosurgeon, never having changed my mind about what happened when I was eight. Part of the reason I chose to become an RA is that I want to help people in any and every way that I can. Something to know about me is that I have a black belt in the mixed martial art of Kajukenbo, in which I have been training for 9 years, and I have also played softball for 12 years. You can often see me working out at the plex, or hear me listening to music in my room. I am a very outgoing and social person so don’t be afraid to say hi or spark up a conversation with me. I am fully bilingual in French and English. Fun fact: I am the 2017 World Kickboxing Champion for my age and weight class. I chose Bishop’s because it truly felt like a home away from home. I fell in love with the people, the atmosphere and the values that we have here at BU. I have no doubt in my mind that you will love it too and that within a few days you will have purple running through your veins like the rest of us! Hi Everyone! My name is Justine and I come from a small town just outside Halifax, Nova Scotia. I will be in my second year here at Bishop’s studying towards a double-major in business and economics. I am super excited to be a member of the Mack RA team for the 2018-2019 year! The reason I chose Bishop’s was because of the friendly, tight-knit vibe. Everyone is so approachable (even the professors)! You’ll find we are like a family and everyone has a place here! It really is a home away from home for me. There are many opportunities and resources for students and I hope you all learn to take advantage of them during your time here. Some of my favourite pastimes include playing piano, reading, adult colouring, boardgames, making use of the squash courts at the plex, and (most importantly) dancing like a fool to 80s music. I am very much a people person and I encourage you all stop by whenever I’m in! I’d love to chat, or watch Friends with you on Netflix, and I’ll definitely offer to make you a cup of tea! I look forward to getting to know all you wonderful people in September, but in the meantime if you have any questions, want to say hello, or tell me your favourite song to rock out to (Mine is “Come On Eileen” by Dexys Midnight Runners) I would LOVE for you to reach out to me at: jkroll17@ubishops.ca. You made a great choice deciding to come to Bishop’s. I hope it’s everything you expected and more. See you soon Gaiters, cheers! Hey there future Gaiters! My name is Gianni and I’m from Toronto, Ontario. 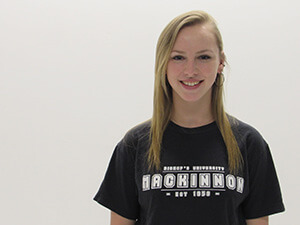 Here at Bishop’s University I am studying elementary education and I am in my second year! I am so excited to be a part of your RA team for Mackinnon during the 2018-2019 academic year. Mackinnon has such a great atmosphere, so don’t be surprised if you find it becomes your home away from home! When not studying to be a future teacher, I love every, and all sports, my favourites being hockey, rugby, baseball and lacrosse. You will most likely see me wearing my favourite team’s jersey, the Philadelphia Flyers. Not a big sports fan? That’s ok! Here at Bishop’s one thing we all have in common is that we bleed purple! Bring all your purple gear cause you’re going to need it cheering on your gaiters! I hope you have a fantastic summer and can’t wait for you to join our community this September. If you have any questions about the residence community or Bishop’s in general, feel free to send me an email at gmorrone17@ubishops.ca. Greetings! 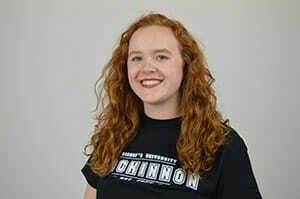 My name is Leigh Gardner and I am your RLC for Mackinnon, Norton and Pollack residence! My role here on campus is to ensure that all members of the residence community have access to a safe and inclusive learning and living environment. I live in the Norton residence apartment, so you will see me moseying around campus. Please don’t be shy, come introduce yourself! My hobby interests include cooperative farming and sustainable farming practices. I spend free moments playing violin, cycling around the eastern townships, and running mountain trails. I’ve recently discovered the world of graphic novels, so calling out to all seasoned readers: any recommendations are appreciated! My office is located on the first floor of Paterson residence. If you have any questions or concerns about residence, or you would like to inquire about activities available both within the Bishop’s campus community or Eastern Townships community I encourage you to stop by. You can also reach me by email at Leigh.gardner@ubishops.ca.